Mick Fleetwood, Christine McVie, Stevie Nicks, Lindsey Buckingham and John McVie of Fleetwood Mac, as the British-American band has parted ways with Buckingham. More than 40 years after Fleetwood Mac’s “Rumours” cemented the group into music legend status, the band is hitting the road yet again and the 52-stop tour will end with a grand finale in Philadelphia. This time around the band will look a bit different, though. 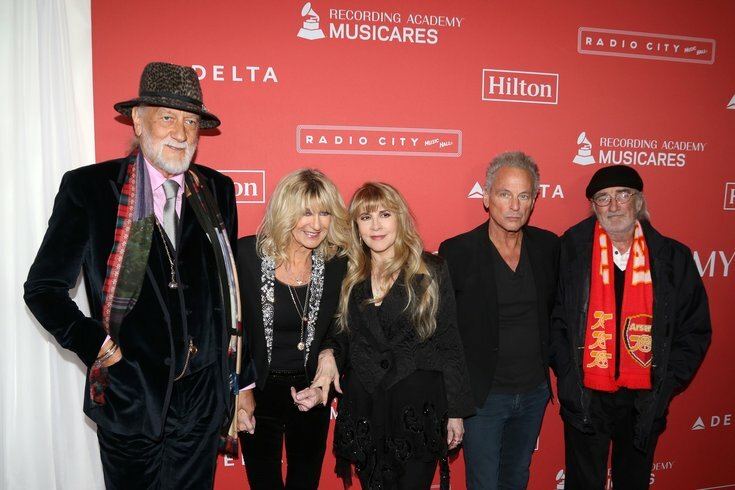 The lineup will represent the band’s latest shift after parting ways with longtime guitarist Lindsey Buckingham, with frontwoman Stevie Nicks citing disagreement over when to tour as the reason for the split. On tour with the band instead will be Mike Campbell, formerly of Tom Petty and the Heartbreakers, and Neil Finn of Crowded House. The tour kicks off in October in Oklahoma, but Philly fans will have a long wait until Nicks and the crew make it to Philly to wrap things up. Fleetwood Mac will play at the Wells Fargo Center on Friday, April 5, 2019. Though you have just under a year to wait until then, tickets go on sale this Friday, May 4 on Ticketmaster. The tour will also include a stop in Atlantic City. Check out the full schedule here.